Three hundred people have trudged through cold river mud to raise money for good causes. 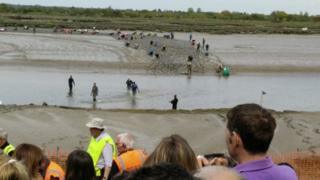 Organisers said up to 20,000 people turned out to watch the competitors wade across the River Blackwater bed in the annual Maldon Mud Race, in Essex. The 500-yard (457m) race was first run in winter 1973 following a pub bet, but was switched to the spring in 2011 because of safety reasons. "It's a crazy challenge," said the mud race charity chairman Brian Farrington. "People think it's going to be easy but it isn't. "It's about 400 metres to cross the river, it's deep mud and then the riverbank is steep and muddy." Image caption This picture's photographer said it looked as though the competitors were "crawling"
Among those who turned out to squelch through the quagmire was someone who had flown over especially from America, said Mr Farrington. "We've had people come from all over the world to take part before: Japanese, Dutch, Swedish," he said. While the fastest competitor completed the 2016 course in under four minutes, the last person back took 40 minutes. Organisers hope about £50,000 will be raised and split between the mud race charity and competitors' own choices. The race's origins go back to when the landlord of the Queen's Head pub, on Hythe Quay, was dared to serve a meal on the saltings, land in the river that only appears at low tide, dressed in a dinner jacket. It was a success, so the next year a bar was put on the saltings, which 20 people waded across to before drinking a pint of beer and struggling back.